Discover the many faces of Mumbai! Learn more about its history from the Fort district and from its imposing buildings and learn about local customs while we mingle with residents at the market and watch the faithful at prayer in the small and characteristic temples. We begin our tour at the Fort district where, despite the name, there is no fort today but only breathtakingly beautiful buildings of great historical importance. We begin our walking tour at the Asiatic Society Library, which was once the city hall. We arrive at the Flora Fountain, the graceful stone fountain dedicated to the Roman goddess, passing by the Horniman Circle, the park inaugurated in 1869 with an ornamental wrought iron fence enclosing magnificent gardens. We proceed with St. Thomas Cathedral which we visit only from the outside, and then head towards the General Post Office Building, the Supreme Court Building and finally the University of Mumbai, which we visit from the outside. At the end of this part of the excursion, we visit a typical Indian example of Victorian Gothic architecture: the Chhatrapati Shivaji Maharaj Terminus, built in 1837 and christened Victoria Terminus, to commemorate the Jubilee of the British Queen. Our last stop before lunch is at the Gateway of India, the symbol of Mumbai, and the only entrance to the city before the advent of aeroplanes. 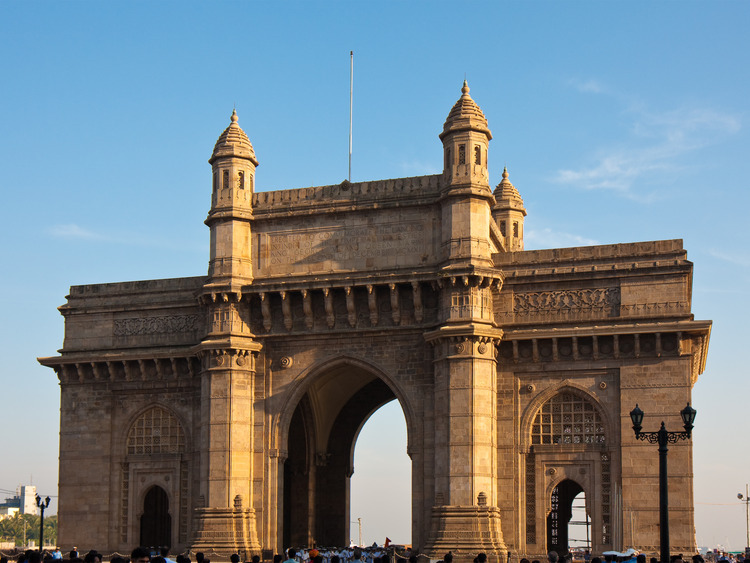 Built to celebrate King George and Queen Mary's visit to India in 1911, this imposing 26-metre-high arch situated opposite the Taj Mahal Hotel is an unmissable point of reference for those who arrive at the city by ship. After lunch at a hotel, we can do some shopping at the Crawford Market. Caught between two worlds, the Fort district and the narrow streets of the old city, the market probably represents the last outpost of British Bombay, as it explicitly recalls Victorian London with its smell of hay and its 15-metre-high awnings. Lastly, we visit the Banganga tank and the Walkeshwar Temple Complex. The excursion involves lots of walking, it is therefore recommended to wear comfortable shoes.